There exists two dynasties with the name of Kalachuri who had ruled the dynasties from the 10th-12th century AD, one ruling over areas in Central India (west Madhya Pradesh and Rajasthan ) and were called Chedi or Haihaya (Heyheya) (northern branch) and the other southern Kalachuri who ruled over parts of Karnataka. The Kalachuri kings were known as Kalachuris of Chedi or Chedis. 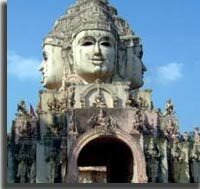 They established their kingdom in Madhya Pradesh with their capital at Tripuri near Jablapur. The founder of this dynasty was Kokalla I. 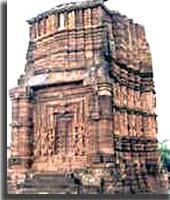 The Chedis had to face the rulers of Kannauj and Malwa, the Chalukyas and Rashtrakutas. They also had to defend their territory against the Palas and rulers of Kalinga. Gangeyadeva was one of the most important rulers of Kalachuri dynasty. He tried to make the Chedis the paramount power of Northern India. The Kalachuris of Dahala rose to be the greatest political power in India during the 11th century A.D. This was mainly due to the military genius of Gangadeva king. Gangeyadeva issued coins of different metals, sizes, weights which were in Gold, Base Gold, Silver Gold, Silver, Silvery copper (Billon) and Copper. Perhaps an important factor contributing to his success was the factor that his kingdom escaped the devastating raids of Sultan Mahmud which affected most of the other great powers to its north and north-west. In the token of his great victory he assumed the proud title of Trikalingadhipati, 'Lord of Trikalinga'. Gangeyadeva assumed the title of Vikramaditya. He died at the sacred city of Prayag (Allahabad). Probably he ascended the throne before 1019 A.D. and died about 1040 A.D.He was succeeded by his son Karandeva. He is said to have defeated a number of people in the south such as the Pallavas, Kungas, Muralas, Pandyas (South) and Kuntalas, (probably the Chalukya King), Somesvara I during A.D. 1048. He was more successful than his father not only in the south but also in the north-west. In 1072 A.D. he abdicated the throne in favor of his son Yasahkarna.The Kalachuris dynasty declined by 1181 AD. 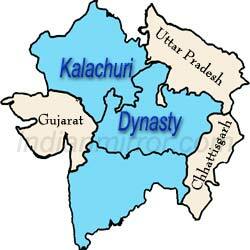 Kalachuri Dynasty- The Kalachuris took the place of the Chalukyas of Kalyana in the early part of the twelfth century, had a relatively short but stormy rule. The period threw up two striking personalities: An energetic and adventurer who flouted the authority of his Chalukya master and achieved the Kalachuri independence - Bijjala. Another figure of eminence was Basaveshvara who marshaled a virile, revolutionary movement of religious and social reform, which goes by the name of Virasaiva Movement. The Kalachuris, also known as the Haihayas, were an ancient people known from the Epics and Puranas from 249 or 250 A.D. Many Kalachuris were settled in different parts of Northern India. In the later half of 6th century A.D., they ruled over a powerful kingdom comprising Gujarat, northern Maharashtra, and some parts of Malwa. One of the founder of a principality is Sarayupara in the modern Gorakhpur District. The other, which soon became very powerful, ruled in Chedi country in Bundelkhand. The Kalachuris of Chedi also known as kings of Dahalas, had their capital at Tripur, represented by the modern village of Tewar, six miles to the west of Jubulpore. Northern Kalachuri family ruled in central India with its base at the ancient city of Tripuri (Tewar); it originated in the 8th century, expanded significantly in the 11th century, and declined in the 12th–13th centuries. Southern Kalachuri Kingdom (Kannada) (1130 - 1184) at their peak ruled parts of the Deccan extending over regions of present day northern Karnataka and parts of Maharashtra. Their rule was short and turbulent, yet very important from the socio-religious movement point of view. A new sect called the Lingayat or Virashaiva sect was founded during these times. A unique and purely native form of Kannada literature-poetry called the Vachanas was also born during this time. The writers of Vachanas were called Vachanakaras (poets). The Southern Kalachuri kings minted coins with Kannada inscriptions on it. Gajasaradula type coins were mostly gold or copper. Some of the common ones were the seated goddess type along with the name of the issuer which is generally prefixed with Srimat and suffixed with Deva. According to legends, Kalli meaning long moustache and Churi meaning Sharp knife. Kalanjarapuravaradhisvara- is Lord of Kalanjara. Mount Kalanjara is in north central India, east of the Indus Valley floodplain. This name Haihaya is supposed to be derived from haya (a horse). Other theories also support the source of their dynastic name. They were also referred to as Katachuris (shape of a sharp knife). A prince of the lunar race, and great-grandson of Yadu. A race or tribe of people to whom a Scythian origin has been ascribed. The Vishnu Purana represents them as descendants of Haihaya of the Yadu race, but they are generally associated with borderers and outlying tribes. In the Vayu and other Puranas, five great divisions of the tribe are named as Talajanghas..